Any activity that encourages physical movement will help you build your body. However, before you embark on any new exercise regimen or physical activity, get your physician's approval. 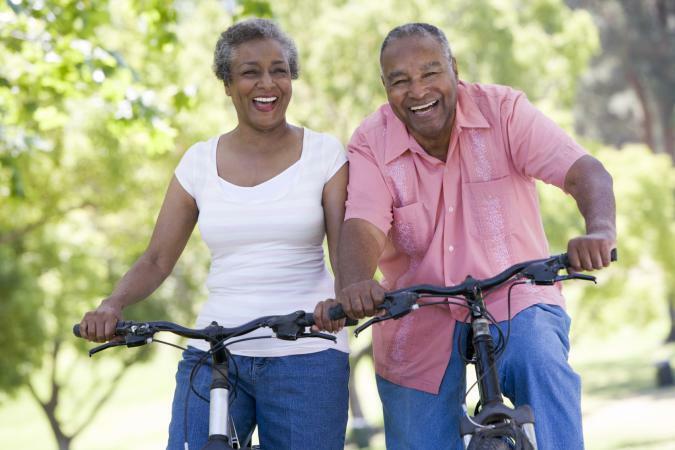 Silver Sneakers is a program that offers Medicare-eligible adults memberships to participating fitness centers. The program encourages healthy living through fitness classes, social gatherings, and seminars on healthy living. Seniors can also have access to a program advisor and online support to help address seniors' unique health needs. The National Senior Games Association oversees the Senior Olympics. Seniors compete on a state level in a variety of sports with a goal of winning a national championship. Check the directory for your state's games to learn how to get involved. A walk in your neighborhood, at the mall, along the beach or around your favorite park is a great way to start the day. For variety, combine walking with another activity such as bird watching, a scavenger hunt, or letterboxing (an outdoor activity that combines hiking and treasure hunting). If you have a handheld GPS or Smartphone, geocaching (similar to letterboxing but using GPS coordinates) might be your thing. Many communities are building bikeways along abandoned inter-urban railway lines. Your local or county parks department can provide you with bike path locations and even maps, or you can look on Trail Link, the trails to rails conservancy, to see if there are paths near you. Canoeing and kayaking are excellent ways to get outdoors, get some exercise, and see nature. Best of all, you don't have to buy a boat. Canoe liveries rent everything you need at reasonable rates. Walking along the bank of your favorite stream or lake in search of that elusive trout or catfish, can provide a wonderful, low-impact workout. If you happen to hook a "keeper," you'll have all the exercise you can handle and then some. Whether swimming vigorous laps or lazily dog paddling around the pool, water can provide rigorous and beneficial exercise for seniors. It is a great way to increase circulation, and it is the perfect exercise for those who struggle with arthritis, since it places no pressure on the joints. You could join a senior league or play with friends at the local park or rec center. Your choice of sports is limited only by your physical condition and interest. Dancing is a great aerobic exercise. Options include ballroom dancing, line dancing, tap, folk dancing and much more. If ballroom or tap isn't your thing, but you still love dancing, try Zumba Gold. Zumba's a high-energy Latin-inspired dance workout, and the Gold variety was designed with seniors in mind. You can find these classes at gyms, community centers, and dance schools. Keeping the mind sharp is important for people of all ages, but becomes even more important as you get older. Many colleges and universities have lifelong learning programs. Taught by professors, seniors can enjoy programs that cover topics, from architecture to cultural views of Iraq and women's studies. Many of the classes are rich with discussion, guest speakers, and field trips. Some programs are seniors-only, while others allow attendees to audit undergraduate classes. Why not consider adding a hobby that you never had the time to develop before? Music nourishes the brain. A study by Brenda Hanna-Pladdy, PhD, and Alicia MacKay, PhD, found that seniors who played musical instruments performed better on cognitive tests than those who did not play an instrument. If you have always wanted to learn to play the trumpet, saxophone, or guitar, go to your local music store and ask about private lessons for senior beginners. Better yet, check out the New Horizons International Music Association (NHIMA), a non-profit organization that provides entry points to music making for adults, including those with no musical experience as well as those who were musically active but have not been for a long time. Work on your memoir or learn to write poetry. Books at your local library or bookstore will teach you the basics and get you started. Try writing your thoughts and memories down in a journal. Journaling is great emotional therapy. Who knows? You might even discover a hidden talent for writing. Join a book or writer's club in your community. It does not have to be just for seniors. Intergenerational discussion can be stimulating for everyone in the group. Humans are social animals. While there are certainly spirit-enriching activities you can do alone, including meditation, group activities are, by far, more satisfying for most people. Involvement in church or civic organizations or time simply spent with family and friends are all spirit enriching activities you can and should do. Most senior centers provide venues for bridge, checkers and other card games as well as craft classes and even exercise programs. Senior centers also organize group trips and provide lunches for participating members for a nominal fee. Red Hat Society founder Sue Ellen Cooper believes that women of a certain age can live life with élan, interest, and gusto. What started as a few friends over 50 going out for tea in their red hats in the 1990s has swelled to an international "dis-organization." Put your long-acquired business acumen to good use as a mentor in SCORE. Originally an acronym for Service Corps of Retired Executives, today SCORE is a powerful tool for small businesspeople and entrepreneurs. If you are considering starting a new business of your own in retirement, you can benefit from this service as well. Whether it's a tropical vacation or a trip to a local attraction, there are plenty of fun places to explore. Groups, such as Elderhostel, organize trips that are ideal for seniors. If you are part of a couple, turn travel into a romantic getaway at a bed and breakfast. There are thousands of charities and civic organizations crying out for helping hands. People, like you, with valued experience and time to make changes happen are always in need. It is not necessary or even desirable, to be active all the time. You can set your own schedule and do as you please. Set time out of your day to sit back and relax. After all, you have worked hard. Take time for yourself and enjoy the quiet of the day. Now is the time to do the things you love. Figure out which activities make you the happiest, make a list, and dive in. Don't be afraid to explore new activities, especially if it's something you have always wanted to do. Enjoy your time as an independent senior and let the good times roll!